Is it possible to make one page Landscape in Word Document while all the other remaining pages of the document are in portrait mode? 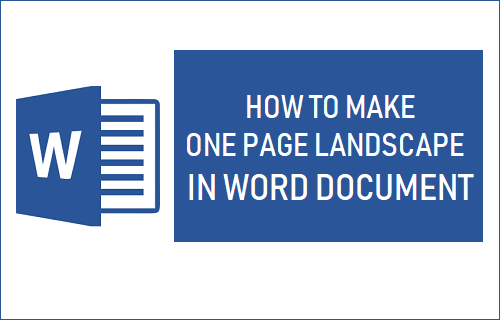 Let us go ahead and take a look at how to make single page Landscape in Microsoft Word. For the purpose of this article, let us assume that you have about 10 pages in a Microsoft Word Document and find that page 2 or a section of the content on page 2 would look better in Landscape Mode. This objective can be achieved by converting page 2 into Landscape Mode while allowing the remaining pages to be in Portrait mode. While you may think of this task as being easy, it is not – If you are not familiar with using section breaks in Microsoft Word, you will have a hard time figuring out the steps to make one page Landscape in Word Document. Follow the steps below to make one page Landscape in Microsoft Word Document. 1. Open the Word Document and place your cursor at the very beginning of the page that you would like to flip into Landscape mode. For example, to flip page 2 in Landscape mode, the Cursor needs to be placed at the beginning of Page 2. 2. Once your Cursor is in the right position, click on Layout > Breaks > Next Page, in order to Insert a section break (Next Page Break) at the very beginning of the Page that you want to flip into Landscape Mode. Note: To view section breaks, you can turn on Page Break Markers by clicking on Home > Show/Hide Page breaks icon. You won’t be able to view the Next Page Break Marker without Page Break Marker being turned ON. 3. Now, place the Cursor at the end of page 2 and click on Layout > Breaks > Next Page in order to insert another section break at the end of page 2. 4. After inserting section breaks, click on Layout or Page Layout > Orientation > Landscape and you will see the Content between the two section breaks flipped into Landscape Mode. In simple terms, all that is required to make a single page Landscape in Word document is to enclose the contents of the page between two section breaks and this will allow you to switch the orientation of that particular page into Landscape mode.